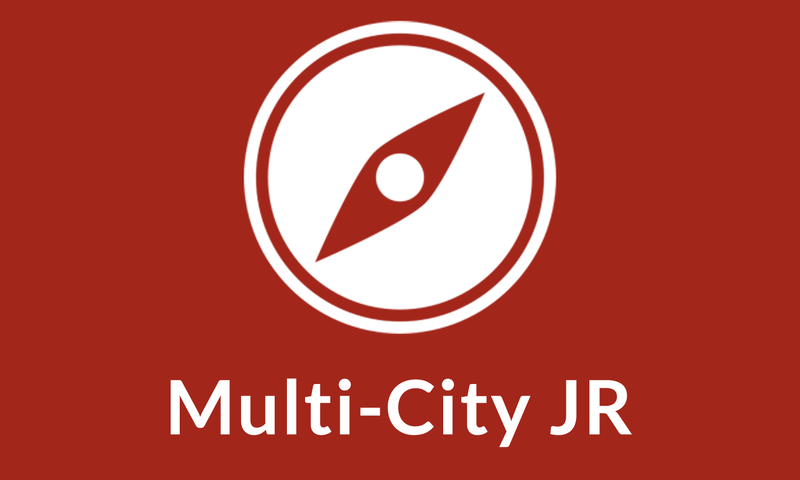 The Multi-City JR Plugin gives you the ability to add location based filters on sites powered by the JobRoller job board directory theme. Once a location is selected by the user, they will only see the jobs and resumes from that location, until they switch to another region or choose to browse from all cities. The plugin comes with a widget to add to the sidebar, in addition to give you the ability to place the location drop down menu in the top navigation. Open JobRoller → JMC Plugin Options page and read instructions to setup the plugin. this would be awesome for classipress any plans for this ? There are a couple of multi-region solutions available for ClassiPress already, though not available on the marketplace. Will you be offering a geo or multi-location and advanced search plugin for Clipper soon? If I remember correctly, Clipper listings cannot be geo-tagged as in Vantage or Jobroller, which is the reason they can’t be filtered by region. No immediate plans for a plugin for Clipper, although I am looking to create a child theme for it. I will be purchasing your location plugins in the near future for my classipress site. I like the Singapore nanny site you created. Please PM about it. I need something similar for a different industry and would like to know if I can purchase the mod from you. Do you think future versions of Clipper won’t include location or geo features? Perhaps other developers and one of the staff at Appthemes can respond to this. I am looking for multi-location solution for other themes like classipress too, and was hoping to find one here in marketplace. Could you point me to those other solutions you mentioned that are out there? Can you please PM me on the forum. It will be inappropriate to post the link here. Can you point me to the best one please to achieve the above ? Can you please PM me on the forum? Sorry this is outside the scope of this product. Very well done Mohsin.I like it. Thanks Rahim for your kind words! Congrats on your awesome Simplux child theme going live! I have replied to your comment on my website regarding the nanny website. Regarding the Clipper theme, I am no sure, but wouldn’t bet against it. 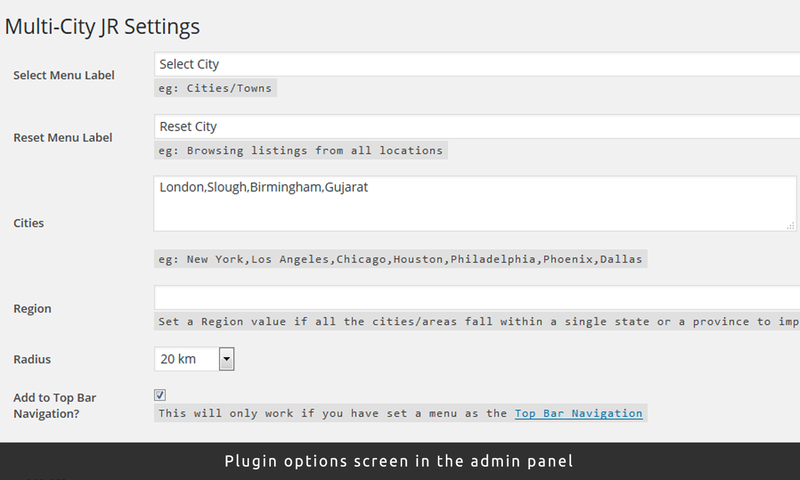 I will hopefully create a multi-city plugin for Clipper when there is location tagging available. Does this plugin work correctly for e.g. indeed plugin aswell? Hi, this plugin has not been tested with Indeed, since the Indeed plugin does not work outside the US or something like that. So, Indeed is now everywhere does it work with Indeed jobs or not? What about cities and countries? It does not work yet with Indeed, but I will be looking to get it integrated with it, now that it is available in my region. Thanks! Many thanks for it, really! As soon as I see it working, the sooner I get it. By the way, it will be extremely useful if you could filter by country and category! Crucial added value! Any update with regards to the Indeed’s integration? When do you think that it will become available. Looking forward to it, please keep me posted! Can I set countries instead of cities? No, it does not affect the job posting in any way. I want to start a coupon site.I am planning to buy Clipper theme. 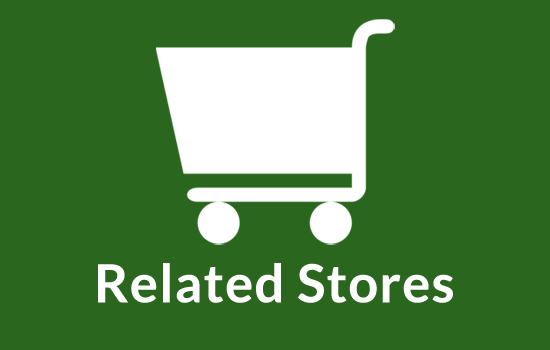 I also need some additional functionality like searching coupon with city. Can we Multi-City addon to the clipper coupon theme? I want to list job by location as a clickable Menu, is it possible? I would really like to know whether this plugin works with cities and countries and whether it indexes or integrates jobs from Indeed API. Many thanks! Is this plugin compatible with latest theme Jobroller 1.7.4 ? Yes it is compatible with JobRoller 1.7.4. I have purchased a Job roller theme . Yes, the plugin is meant to work with the JobRoller theme only. Can I get a screenshot of how this looks in the header? Not sure what you mean by “how this looks in the header”. Please can you explain? In the description for the plugin, it says at the end “in addition to give you the ability to place the location drop down menu in the top navigation.”. I wanted to see how that looks. 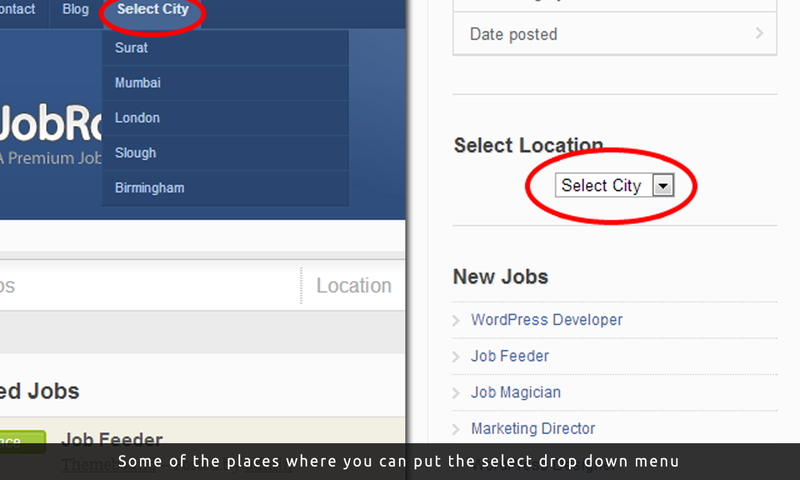 It’s as setup in the demo link, check the “Select City” drop down in the top menu. Yes, it can work for multiple countries, all you need to do is feed country names instead of cities. i bought the jr multi-city plugin and configured the countries as you mentioned.But,the site is pulling only indeed job results from one country not from the other countries.will you pls help me in this. i sent the site details in pm.thanks. 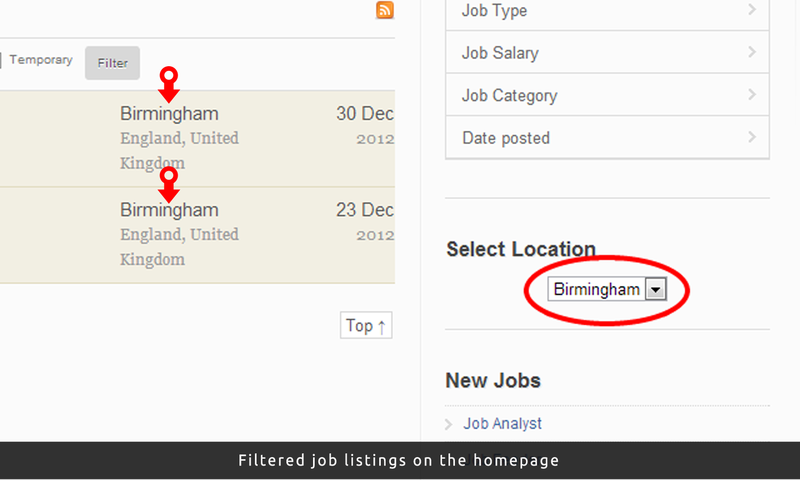 The plugin only filters normal job listings and not the ones that are displayed via an external feed. 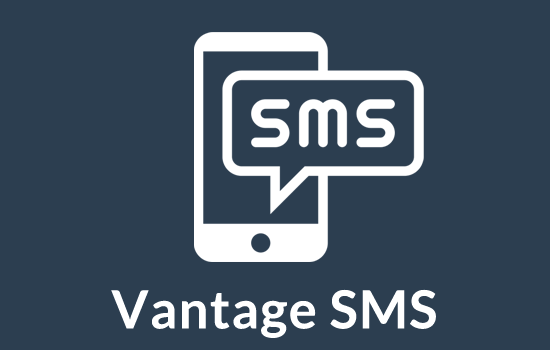 Please use email for support as mentioned under the support tab. We don’t use the AppThemes forums. this plugin is compatible with Classipress version 3.5.7 and WordPress 4.5.3? This plugin is only compatible with the JobRoller theme. Is this plugin working with indeed yet please, also can I set it up for counties as well as cities?